Enjoy a satisfying meal at Indian Curry House serving guests of ACHAT Comfort City-Frankfurt. Buffet breakfasts are available daily from 6:30 AM to 10:00 AM for a fee. This 3-star hotel in central Frankfurt lies next to Frankfurt's zoo and opposite Zoo underground station. It offers a daily breakfast buffet. All rooms at the Hotel am Zoo come with satellite TV. They feature views of either the zoo or Frankfurt’s skyline. Wi-Fi internet is available throughout the building for an additional charge. The Hotel am Zoo's restaurant and bar are open 5 days a week. This lovely hotel is located in Frankfurt City. A total of 75 units are available for guests' convenience at Cult. Cult is not a pet-friendly establishment. Found in Frankfurt’s Alt-Sachsenhausen district, the Hotel Primus Frankfurt Sachsenhausen is just a short walk from the River Main. 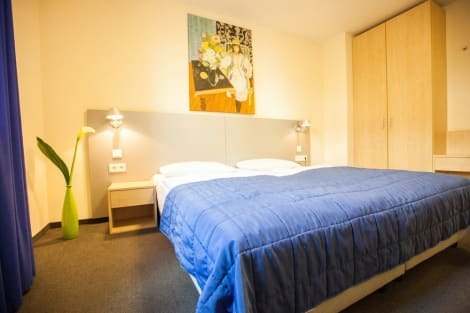 Ideally located for exploring the city’s museums and cultural sights, the hotel is within easy walking distance of the Frankensteiner Platz tram stop and five minutes from the Lokalbahnhof S-Bahn station. Smart and modern, this 3-star hotel has a 24-hour reception and offers complimentary wi-fi access throughout, for your convenience. You’ll also find an excellent selection of bars and restaurants in the local area, many serving local delicacies. The Novum Hotel Primus Frankfurt’s 35 rooms are decorated in a classic style, and furnished with flat-screen TVs and desks. With the exception of the hotel’s Budget Rooms, all also offer private bathrooms with showers and hairdryers. Located in Frankfurt, Living Hotel Frankfurt by Derag is a 5-minute drive from Henninger Turm and 9 minutes from Staedel Museum. This 4-star aparthotel is 2.1 mi (3.3 km) from Frankfurt Zoological Garden and 2.2 mi (3.5 km) from Goethe Tower. With a stay at Hotel Münchner Hof, you'll be centrally located in Frankfurt, steps from Financial District and 13 minutes by foot from Frankfurt Trade Fair. This hotel is 0.5 mi (0.8 km) from Staedel Museum and 0.6 mi (1 km) from Maintower.